nVidia GeForce GTX 550 Ti - this is the graphics card of the middle class with high performance and full support for DirectX 11. She pulls almost all modern games without brakes. With her will feel comfortable as a gamer and as an office clerk. 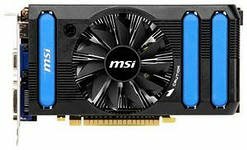 But with technology Voltage Tweak and software interface Smart Doctor, you can overclock the graphics card and get a significant performance gain in three-dimensional applications.